For the Spiced Brown Sugar Syrup, dissolve 2 cups light brown or evaporated cane sugar into 1 cup water over low heat. Add a ¼ teaspoon each of ground cinnamon, ground cloves and ground ginger. Stir until combined, and allow to cool. Simply add all ingredients to a glass of any shape or sort and stir to combine. Some may like a cube or two of ice. Grate a bit of fresh nutmeg over the top. 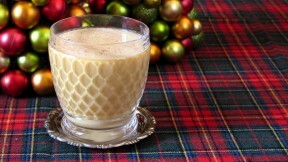 Lesley Jacobs Solmonson, a cocktail blogger, prefers homemade advocaat, but says store-bought advocaat will work fine. Find an advocaat recipe on the 12 Bottle Bar website. For the ale, any quality ESB with a nice bite should work – whatever ale used should not get lost in the mixture.